Researchers have made a single walking DNA molecule, that can be guided over a track. The molecule has 4 tentacles that bind to the vertical sticks on the track. They cut the stick (short sticks at the left) and bind to the next stick, dragging the molecule along to the red target at the right. 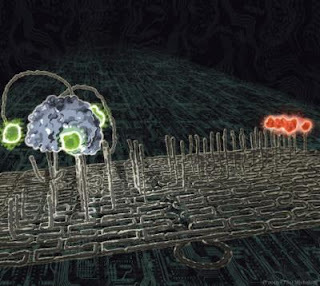 They're imagining future one molecule nanobots for packet delivery (medicine) and factories in the future.